SPRING VALLEY – The Foothills Christian High girls basketball team remained undefeated with a win over previously unbeaten Monte Vista, 68-60, at the Monarchs’ gym on Friday night. The Knights improved to 6-0 with the victory, while the Monarchs fell to 2-1. The game was indicative of how close the teams are ranked. Foothills Christian junior ELLIE TURK had 29 points, eight rebounds, eight assists, six steals and five blocked shots, while sophomore teammate ARANXTA FONSECA added 17 points, six rebounds, three assists and five blocked shots. Freshman NATALIE BRAVO added nine points for the Knights. The hosts got off to a terrific start, taking an 11-4 lead after junior JOURDAN BARBOUR made a free throw with about two minutes to go in the first quarter. Monte Vista made a few more three-pointers to stave off the Knights’ worthy early challenge. However, Foothills caught fire late in the second quarter. Sophomore CHRISTY SARKIS got things started for the Knights with a bucket and the Knights went on a late run. Senior EMYROSE ANCHO also added a field goal and FCHS led 33-26 at halftime. Knights junior ANGELA CREEL started the second half scoring, but Monte Vista found a second-half wind early, eventually pulling into the lead, 39-37. But Turk would make a couple of three-pointers to help FCHS regain the advantage. 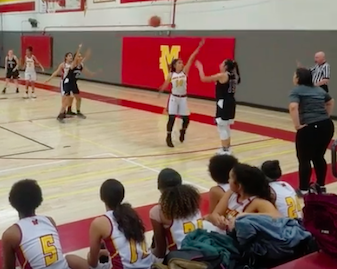 The Monarchs would continue to make it interesting late, as senior SARA TAHA made a field goal and Monte Vista got back to within 58-56, but Fonseca and Turk combined for six points and all of a sudden the lead was double digits with just over a minute to play. MILLIKEN 74, EL CAPITAN 51 – The Rams from Long Beach showed their class against the Vaqueros on Friday despite 31 points from the Vaqueros’ MACKENZIE CURTIS. El Capitan trailed 45-23 at intermission, but Curtis scored 19 points in the second half. “Everyone was uptight partly because of the fact KYLIE MEAD rolled her ankle last night and was out,” Curtis said. “But we had a heart-to-heart at half and came out as the El Cap team people know. The Vaqueros limited Milliken to just eight points in the third quarter. “We let loose and did our jobs. It would have been a different end result if we played that way the whole game,” Curtis said. The short-handed Vaqueros had just four players register points in the scorebook in this one, including eight points from SHIANA PERES. Meanwhile, super-deep Milliken had 12 girls put up points. “It has been a rough start for sure,” El Capitan head coach DARIN CURTIS said. “We are playing some very good teams with only six players. It is early in the season, but it is in these tough times that you will see what you’re really made of. Your true character is revealed when faced with adversity. The Vaqueros are good, playing a tough schedule, but the loss was their third straight. El Capitan will be favored at Fallbrook on Saturday. RANCHO BUENA VISTA 50, WEST HILLS 46 – The Wolf Pack came close to snapping their season-opening losing streak on the road against the Longhorns, however, West Hills fell to 0-4. CARLSBAD 61, SANTANA 19 – The winless Sultans (0-5) were overmatched by the top team in Division II, as the Lancers improved to 5-1.